The occurrence of foxtail in pastures and hay fields seems to be higher this year than in years past. The weather we have had this season could be the cause. DO NOT feed foxtail infested hay to horses, cattle, or other livestock. 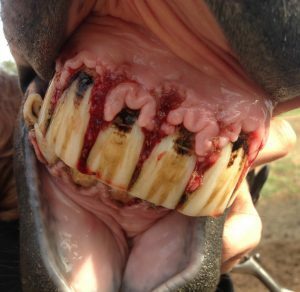 The awns can become impelled in the gums and tongue. These can get infected and ulcerated. Here is a link for identification and control of Foxtail by Dr. Patrick McCullough. Posted in Grazing, Livestock, Uncategorized. Bookmark the permalink. Next: Does 2,4-DB Reduce Sicklepod Seed Production?